Feast your eyes on an amazing lineup of Colorado-themed food, beer and music to kick-off Keystone’s Bluegrass and Beer Festival! New Belgium Brewing and Chef Chris Rybak pair to deliver a unique twist on a classic beer maker’s event. Eat, drink and pick your way through six small plate stations, each matched with a New Belgium sample. Foodies and beer lovers; your palate will thank you while your feet will be tapping to the best in Colorado Bluegrass courtesy of Summit County’s own Shaky Hand String Band. New Belgium Beer Makers and Chef Rybak will share more about the menu design, flavor profiles and education on the brewery and the showcased brews. 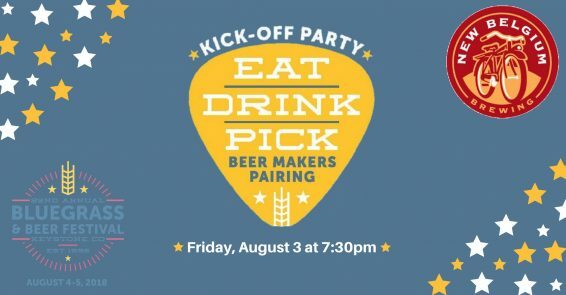 Limited Seating Available – This Beer Maker’s Pairing is a social affair! Two-step to each station’s creation and pick your favorites. Menu – Chef and Brewmaker’s Picks! *Beer pairings are in bold. Chris is a Culinary Arts graduate and a Certified Executive Chef. He came to Colorado on vacation during the winter of 1986 and basically, has never left. In 1986 he started as a Sous Chef at Keystone and was the Chef who opened the Conference Center and the Alpenglow Stube. In 2000, Chris was honored as “Chef of the Year” from the Colorado Chef’s Association and has stayed involved in the Culinary Arts Industry over time. After many roles at Keystone, Chris moved to Utah for one season as the F&B Director at Park City Mountain Resort. Chris missed his two daughters and home here in Summit County and moved back in May of 2007 to do restaurant consulting all over Colorado always missing his roles in the ski industry. After a brief phone call from our COO Alan Henceroth, Chris came to A-Basin in November of 2008 and has loved his position ever since. Some of Chris’s passions are; cooking for friends and family, good wine, Telemark skiing, bike riding, the staff at A-Basin, anytime spent with his two daughters and every opportunity to raft a river. Shaky Hand String Band is located deep in the Rocky Mountains. Influences of the high country, the band expresses itself from the beautiful surroundings in which their music is inspired. The band brings a variety of musical backgrounds together to create an intimate and exciting sound that will have listeners singing their songs for many days to come. Playing mainly original music, Shaky Hand String Band has become an outlet to express their imaginations with no barriers or restrictions. Their passions for eachother and their music creates a memorable experience that you surely won’t want to miss. The band formed with a focus on original music, with aspirations to share their sound while touring the globe. The members consist of Patrick O’Halloran (Banjo/Vocals), Jess Moidel (Violin/Vocals), Todd Webster (Mandolin/Vocals), Nick Beato (Bass/Vocals). Each member brings their own special strength to the band in the form of writing, harmonies, melodies, improvisation and rhythm that all make the Shaky Hand sound. With backgrounds in bluegrass, classical, jazz and choir the band carries a broad seasonal sound that falls within the bluegrass world, but reaches into the hearts of polka, gypsy, folk and jazz lovers a like. The Shaky Hand String Band plans on spending Spring and the Summer of 2017 touring throughout the United States from coast to coast. Look for Shaky Hand String Band this year as shows are announced and big developments continue to arise. Sign up to our mailing list here, and follow us on Facebook to keep up with all our happenings, and upcoming events. We love meeting our fans and look forward to sharing our adventures with the Shaky Hand String Band community. In 2015, Jordan passed the torch to New Belgium’s current CEO Christine Perich.